• C-Mount, 656×490 square pixels, external trigger. • 1/2 inch, primary colors Bayer CMOS. • 8 or 10 bits/pixel, synchronization by 1394 bus. • 400 Mbps, partial scanning (AOI, Area Of Interest). • small size 67.3x44x29 mm, 100 grams. • 8-36 VDC, low power 1.7 Watt (12 VDC). • One Basler A6o2fc Firewire-400 digital camera. • One 4.5m (15 ft) 6p to 6p firewire cable. 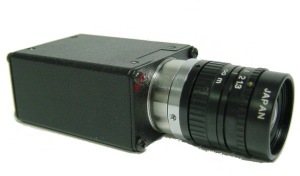 • Unibrain’s Fire-i Software driver and control application for IIDC 1394 Digital Cameras.